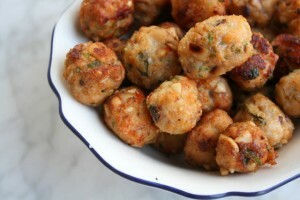 Chicken Balls recipe by Nazia Nazar at DesiRecipes.com. A comfort food in which shredded chicken mix with bread slices and deep fried in the form of balls. Boil the chicken , with all the seasonings and some water. Till the chicken becomes tender and thick gravy remains. Now shread the chicken and remove bones. Mix the soaked slice of bread in chicken and add 1 beaten egg. Mix well and form balls. Dip the balls into beaten egg and roll in crumbs.